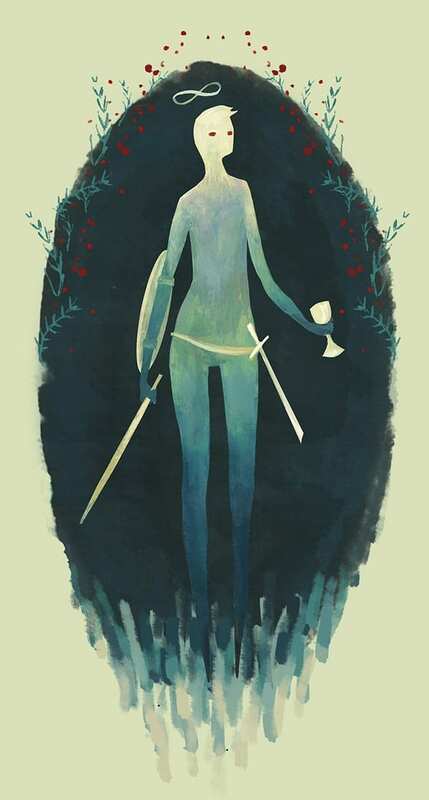 The Magician (I) tarot card personifies all things at their beginning, the starting point of all events and undertakings, the impulse of creation. As the first card of the Major Arcana, in him are all the possibilities and potential of things at their beginning. This is the reason the character was represented as a street performer or craftsman in earlier tarot decks. With changes made to the character of the card by 19th century French occultists, who drew him holding one of the suit symbols while the others lay on the table in front of him, the character of the juggler took on more metaphysical qualities, becoming the Magus or Magician. In the English Rider-Waite deck, a young man stands behind a table on which are placed four objects representing the Minor Arcana — a wand, a cup, a sword, and a pentacle (a disk inscribed with a star of five points). Floating above his head like a halo is the shape of a figure eight on its side, the lemniscate, a symbol of eternal life. Around his waist is a serpent devouring its tail, another symbol of eternity. Over his head is a vine of red roses representing desire. There are also red roses in front of the table intertwined with the white lilies of abstract thought. Red and white are also the colors of his clothes. His tunic is the white of purity and his outer robe is the red of desire, activity and passion. He holds a wand in his right hand which is raised above his head while his left hand points towards the earth. The Magician calls on and joins spirit and matter. Spontaneous, skillful, creative, original, the Magician represents someone of quick understanding, excellent reasoning, intelligent initiatives, and intellectual curiosity at best. At worst, it represents someone of poor concentration, hasty decisions, impulsive actions, scattered ideas and energy, and a superficial or even tricky or mischievous intent. A smooth talker, the Magician easily seduces but his feelings lack depth and his talk and tricks are often exposed. Because of his fertile imagination and eloquence, he is associated with careers in communication and movement like acting, journalism, sales, decoration and design. 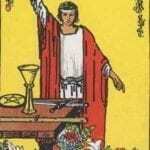 The Magician in an upright position denotes skill, resourcefulness, and the ability to influence the material world. At its best, this card indicates divinely inspired personal power. Skilful, smooth and seductive, the Magician is both cerebral and impulsive. When you are in love, you know how to show it and respond with skill and tact. Some playfulness and imagination will break the monotony of your daily routine. If you are alone, you’re likely to find a new friend or a new romance. At the beginning of your relationship, each of you takes stock of the other’s potential. Your projects and undertakings will be made easier and you’ll be busier in the near future. For those who are looking for a job, there will be opportunities and job offers. You are able to take on this fresh start with energy and self-confidence. If you have a job, you’ll be getting a promotion soon. It is also possible that you be assigned new responsibilities because of your effort and skill in finding solutions to work-related problems. A new initiative will help you realize your ambitions. Your natural potential will allow you to grab the chance to start a new business. If you are already in business, there’ll be new possibilities of development and expansion with the resources you have available. Money flows in both directions. Your know-how allows you to increase your daily income as well as make some money on the side. This extra money gives you a sense of security that makes you less careful in managing your money. You are not in financial danger but you are in a bothersome situation that you can change with some skill. This card is associated with physical vitality. If you are sick, expect to get well again. In a negative sense, the Magician represents a liar, cheater, traitor, or trickster. Beware of new acquaintances or new projects in business. There are big risks of being cheated and prudence is advised. If you are with someone, your relationship is beginning to turn sour. A recent event creates uncertainty in your relationship. A thoughtless initiative, gesture or act upsets your partner. Your partner thinks you are untruthful, full of yourself, or unscrupulous. This puts your future together in question. You’re accused of not using your talents for the best of those near you. Uncertainty about the future eats away at your relationship. You don’t talk about your real feelings but you put on a show or put yourself first. You are only concerned about one person: yourself. If you are not in a long-term relationship, you are flighty and go from one adventure to another without thinking of tomorrow. As a reversed card, the Magician represents dissipated energies, inexperience and incompetence. New projects start off badly or lead to nothing. A recent event prevents a project or activity from moving forward. You are not performing professionally to your full potential. You impose your will and you have trouble recognizing your mistakes. A lack of initiative, stagnancy, and dependence are also associated with the Magician in this position. You make impulsive decisions that go against your own interests. An overflow of energy might lead to restlessness, a dissipation of your energies and physical or mental fatigue — especially with cards like the High Priestess, the Wheel of Fortune, Judgement or the Fool. You are prone to headaches, vertigo and neuralgia especially with the Emperor, the Chariot or the Hanged Man. Avoid acting impulsively, and take the time for small breaks during the day. Learn relaxation techniques, yoga, Tai Chi or something similar. Even though you have what it takes to grow spiritually, you did not do anything about it in the past. A recent event makes you discover your spiritual potential. This is a great time to do something that you have thought about in the past but did not take the steps to pursue. You are open and have an attentive ear to the inner voice that will guide you. It may lead you to looking for spiritual counsel, joining a group or following a spiritual guide. If a recent event has temporarily made it difficult for you to use the spiritual resources you have at hand, you may be inclined to use dangerous occult forces in order to reach your spiritual goals. Be wary of con artists of the esoteric. Also recognize the tendency you sometimes have to lie, boast, and otherwise attempt to manipulate certain people around you. In certain positions, this card indicates a lack of judgement and tact if you do not know how to use all the means at your disposal. It foreshadows tricks, lies, and schemes with the Devil, thoughtlessness and carelessness with the Fool, fickleness with the Lovers, and weakness of character with the Hanged Man. The Magician combined with the High Priestess may indicate that a powerful business partnership between a man and a woman is about to be concluded. It can also represent an initiation into the occult. You’re feeling quite productive these days. You’re getting all your work done at an exceptionally rapid pace. You have laid everything you know out on the table, even though it may be a hasty decision — you haven’t thought things through completely. You may be inspired to write and communicate through words. This combination also indicates some kind of broker (Magician) who helps you decide between stocks, bonds, or real estate options. If you are a woman, look for a new man to come into your life that gives you the spark! This predicts the beginning of a very deep connection. When you get the Magician, you have a positive response to your question. Don’t hesitate. Your goal is within your reach.